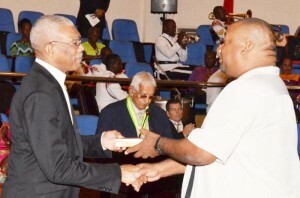 Long Serving Secretary/CEO and founder member of the Club, Hilbert Foster received a Medal of Service on behalf of the Club from its Honorary Patron and Executive President of Guyana, H.E David Granger. A humble Foster described the occasion as the greatest moment in the history of the club and stated that all of the members were proud of its historic achievement. In the history of Guyana’s National Awards, few of any sporting or youth organisations have received awards and the RHTYSC is the first cricket club in the nation’s history to be honoured. Foster stated that the RHTYSC was founded in September, 1990 by three-time Guyana and Commonwealth Youth Service Awardee, St. Francis Community Developers and over the last twenty six years has successfully completed over 6000 projects/activities. The club has made a major difference in lives of countless youths, the elderly and less fortunate. The club currently undertakes 300 programmes/activities on an annual bases under the sub – headings of sports, education, culture, youth development, awards, community development, coaching, anti – crime, youth employment and anti-suicide, among others. Their cricket teams are among the top in Guyana and have together won over 40 major Berbice cricket championships and three national titles (two males and females). The RHTYSC was also named Guyana Cricket Club of the Year in 2004, 2005, 2009 and 2010 and has over the years produced six males’ senior Guyana cricketers, eight females national cricketers, five for the West Indies at different levels and a total of 40 junior national cricketers at all levels. The Club has also produced ninety eight players for the Ancient country and is the home of Guyana’s only female cricket team. Off the cricket field, the club’s achievements are too numerous to mention but Foster, who received the National Sports Personality in 2010 stated that several clearly stand out. These include the restoration of the Lower Corentyne Secondary School in 1991/92 at the cost of $4M, the transformation of the Area ‘H’ Ground from a swampland into a sports Centre, the hosting of a multimillion award Ceremony every year for members and the distribution of over $200M worth of food items, educational Kits, footwear and hygiene kits to less fortunate families and distribution of $10M worth of school bags to students. Other achievements that stand out are the hosting of the Ansa McAl Award of Excellence, Berbice Sports Awards, assisting over 200 youth and sports organisation with over $15M worth of gear and equipment, producing an annual youth magazine, construction of a Charity Kitchen, Youth Information booklet and the remarkable success of the Say No to Drugs, Suicide and Crime and Say Yes to Education/Sports programme. The Management of the Club is currently headed by President Keith Foster while the others are his younger brother Hilbert who serves as Secretary/CEO, Franklyn Ross – Assistant Secretary/CEO, Shemaine Campbell – Treasurer, Keith Hicks – Organising Secretary, Ravindranauth Kissoonlall – Assistant Organising Secretary, Shawn Perriera – Club Captain and Committee Members – Sohan Harry, Mark Papaunah, Terry Pike, Neville Beaton and Erva Giddings. President David Granger serves as the Club’s Honorary Patron while the Over 35 group performs the duties of experienced advisors to the Club Secretary/CEO and Management Committee.